Rhoda's sister Emma was married to Thomas Bennett, son of settler Thomas Bennett. Sarah was first married to Smyrna Bancroft, son of settler Jonathan Bancroft. She was the sister of settlers William Whitney and Luke Whitney and her ancestry can be found on their pages. Also, her sister Mary was the wife of Benjamin Heywood, son of settler Seth Heywood. 1. 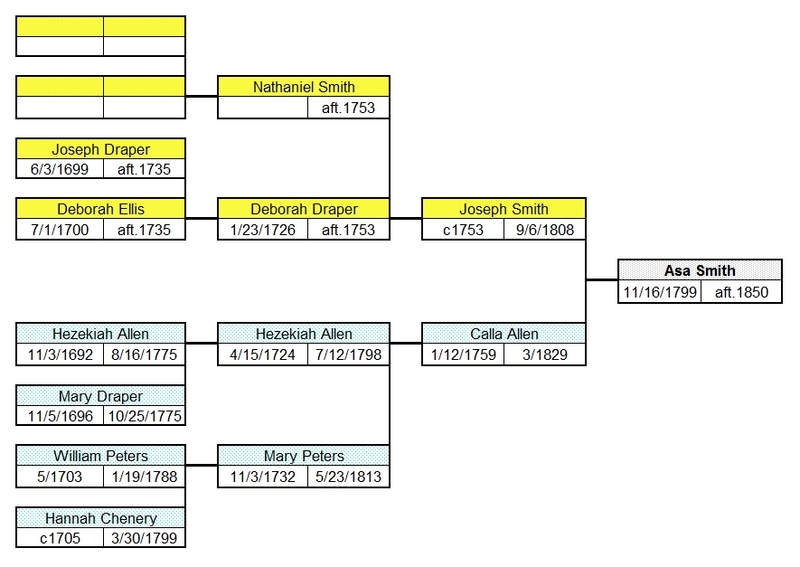 ASA4 SMITH (JOSEPH3, NATHANIEL2, NATHANIEL1) was born 16 Nov 1799 in Westminster MA, and died Aft. 1850 in Prob 1850-1855. 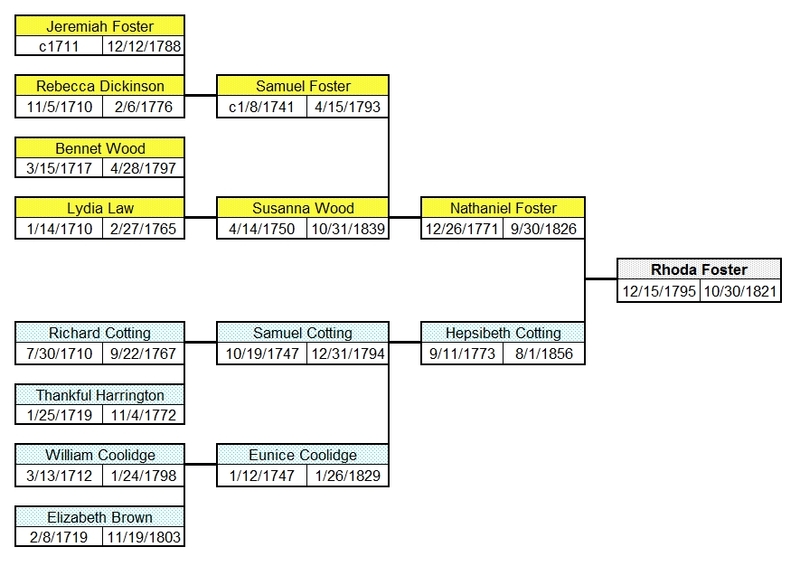 He married (1) RHODA FOSTER 23 Nov 1820 in Ashburnham MA [int 10/16/1820 Gardner], daughter of NATHANIEL FOSTER and HEPSIBETH COTTING. She was born 15 Dec 1795 in Ashburnham MA, and died 30 Oct 1821 in Gardner MA. He married (2) SARAH WHITNEY 24 Oct 1822 in Gardner MA, daughter of WILLIAM WHITNEY and MARY MANSFIELD. She was born 03 Sep 1779 in Winchendon MA, and died 12 Mar 1866 in Gardner MA. 2. i. ASA FOSTER5 SMITH, b. 20 Oct 1821, Gardner MA; d. 21 Apr 1905, Winchendon MA. 2. ASA FOSTER5 SMITH (ASA4, JOSEPH3, NATHANIEL2, NATHANIEL1) was born 20 Oct 1821 in Gardner MA, and died 21 Apr 1905 in Winchendon MA. He married FIDELIA JACKSON 15 Jun 1843 in Gardner MA, daughter of JOSIAH JACKSON and NANCY BOLTON. She was born 26 Nov 1819 in Westminster MA, and died 27 Jan 1894 in Gardner MA. i. HENRY JACKSON6 SMITH, b. 02 Nov 1845, Gardner MA; d. Aft. 1855. 3. ii. CHARLES ALLEN SMITH, b. 13 Oct 1848, Gardner MA; d. Aft. 1920. 3. CHARLES ALLEN6 SMITH (ASA FOSTER5, ASA4, JOSEPH3, NATHANIEL2, NATHANIEL1) was born 13 Oct 1848 in Gardner MA, and died Aft. 1920. He married ELLA A WORCESTER 24 Jul 1870 in Ashburnham MA, daughter of JAMES WORCESTER and SARAH ?. She was born Jul 1851 in Ashburnham MA, and died Aft. 1920.
i. CORA ADELIA7 SMITH, b. 04 May 1871, Gardner MA; d. Aft. 1930.
ii. SADIE ALICE SMITH, b. Abt. 1873, Winchendon MA; d. 05 Sep 1873, Winchendon MA. iii. CHILD SMITH, b. 04 Oct 1877, Winchendon MA.